Australia may have struggled to make veteran lock Paul O'Connell look a fool during the British & Irish Lions' recent march to glory - but his friends clearly have no trouble. The following picture has emerged on Twitter - via @dinglemick/JOE.ie - of the Irishman pictured on his stag do in Lahnich. 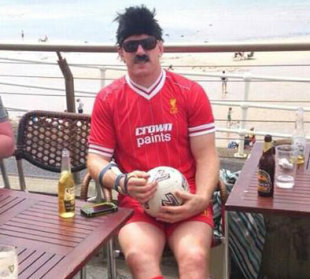 And if the sight of the 6ft 6in giant of the game dressed up as 1980s Liverpool FC legend Ian Rush (we think) is not funny enough - maybe the fact that O'Connell is a proud Evertonian may push you over the edge?